In general: You can only book ONE darshan per day. Reservations have to be done. Please view our information about Children and wheelchair users. Please download the PDF to get familiar with the Darshan-Procedure. Our new on-line booking system uses a User-Account system, that you are familiar with from many websites, for example Facebook, Yahoo etc. This requires that you sign-up first (create a user account ) as shown in Step 1 below. In case you are already a user just login (Step 2). For how to register for Darshan read on under B. You can also change your reservation later on, see C We recommend you als view our FAQ. STEP 1 – SIGN UP AS A USER: click here. Fill out the form, submit it. You will receive an email to confirm the account (check your spam folder in case you don’t see the email). Click on the link in the email, and then log in as in step 2). When you are in the system and can select appointments from the list. In case you receive the error message: For this E-mail an account already exists – , then you already have a user account. Follow Step 2), just log in, in case you know your password. or follow 3), in case you don’t know your password. Forgot password? 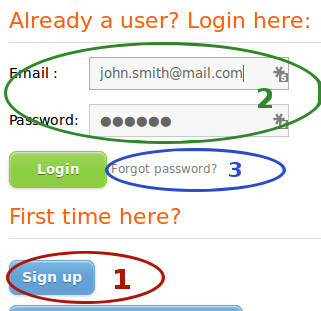 Click on 3: Forgot password or directly here , enter your email and a password will be sent to you. Please also check the Spam filter of your mailbox. If you receive the error message: Could not find a user with this email address, go to STEP 1 to sign up as a user. Once a password has been sent to you, best change it under ‘Profile’ into one that you can remember more easily. Making a booking: When you are logged in, navigate to the event on the Darshan list on the left side: At the top of the left column, under ‘country‘ select your country, where you want to visit the Darshan, for example ‘Australia’ , and you will see the list of Darshan sessions in this country. On the left side, click on the actual session you want to visit. Then on the right side, you will see your booking details. You can now add accompanying persons, one by one. Click on ‘save registration‘ to conclude the process. Do not forget to press the green button Save registration on the right side. Log in with your email and password here – you can cancel your reservation, change the date, or add additional participants or unsubscribe. To cancel the session: Click directly on ‘cancel session‘ , and confirm the upcoming dialogue, and the session will be canceled. Change session attendees: Mark or unmark the box in front of the name of the accompanying person. 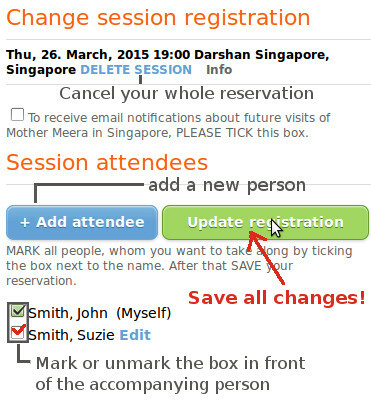 To add a new person click on ‘+ add attendee’ Then, after you are done, save the changes by clicking on ‘update registration’. It is also possible, to unmark yourself, if for a particular session, only your friends are coming. Don’t forget to click on the green button Update registration !